Okay, okay, we know it has been a while since we posted. The truth is, we came within a hair’s breadth of getting a life recently. But fear not, it has passed and we are back, kinda, sorta, at least long enough to add this admirable photo to our blog and this admirable sculpture to our list of large permanent replicas. Created or at least placed in 1980, it is located in Immerloo Park in South Arnhem, in the Netherlands. The artist is Marius van Beek, a prominent Dutch sculptor. You can see its location and another picture of it here on Panoramio. 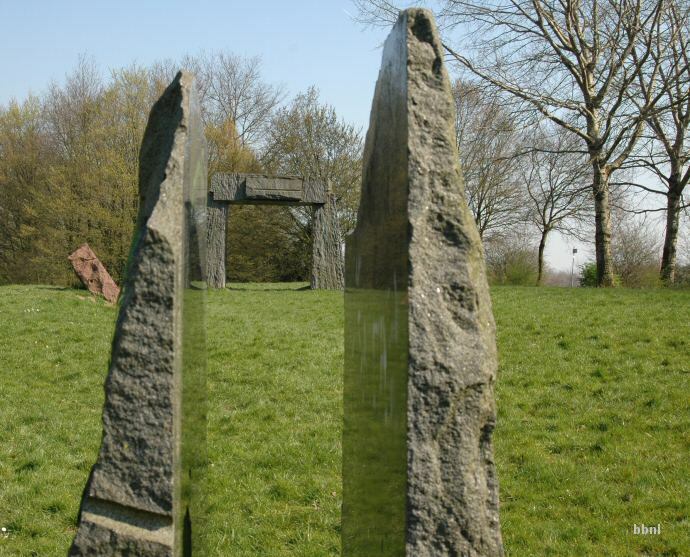 As far as we can make out by using internet translators on the Dutch pages, the two standing stones mark sun positions in spring and fall. The function of the red stone set on a tilt is less clear. Score: 5½ druids. We like the sun alignments and the pleasing form of the gate. Every city should have something like this! This 4 meter by 4 meter replica was built for a special exhibition called The Fascinating World of Stonehenge at the Municipal Museum of Arnhem in 1988=1989. Apparently a similar model of the Newgrange Passage Tomb was also built, although regrettably we have no photo of that. This is a very nice model and would probably rate 7 or 8 druids depending on a closer look. Perhaps Stonehenges come in twos! We don’t have many replicas lined up to post, but we did hear there’s a town in Australia that has plans for one. We’ll post on that sometime soon. Meanwhile, send in your homemade and newly discovered henges. The summer henging season is nearly upon us!